If we fit this generalization, we probably haven’t even noticed it. If you’re a woman with traditionally feminine traits or a man with traditionally masculine traits, there’s little pressure to change (though there are exceptions, of course). But if you’re a woman whose mind naturally makes decisions in an impersonal way or a man who prefers harmony to competition chances are someone has told you at some point that there’s something wrong with you. As with many generalizations, there’s a whole slew of problems related to this observation. According to the Center for Applications of Psychological Type, about 57 to 84 percent of women are Feeling types and about 47 to 72 percent of men are Thinking types. It’s hard to get exact numbers on type distribution, but even these broad estimates show that, while the generalization holds true, there are also quite a few Feeling men and Thinking women. Just in my family of 5, there are three good examples of exceptions to the general rule that most men are Thinkers and most women are Feelers. My dad (ISFJ) and brother (ENFJ) are both Feeling types, and my sister (INTJ) is a thinking type. My mother has asked me not to type her, but as an INFJ I might be the only one in my family who fits the “women are Feeling types” generalization. 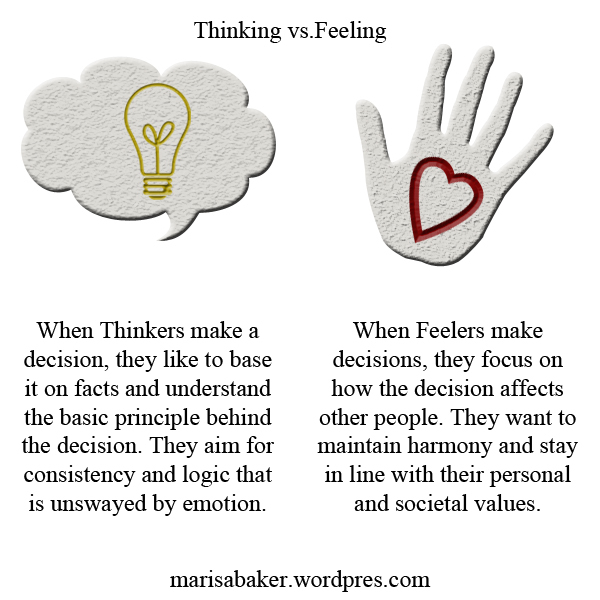 Lest these generalizations lead you to conclude Thinking people don’t have emotions or that Feeling people can’t be intelligent, let’s take a quick look at what Thinking and Feeling refer to when we’re talking about Myers-Briggs types. Both Thinking and Feeling are Judging functions, meaning they describe how you like to make decisions. When Thinkers make a decision, they like to base it on facts and understand the basic principle behind that decision. They aim for consistency and logic when making decisions and try not to let themselves be swayed by emotions (which they do have, but don’t trust as a basis for decision making). When Feelers make decisions, their focus is on how that decision will affect other people. They want to maintain harmony and stay in line with their personal and societal values. In your function stack, Thinking (T) or Feeling (F) is going to be your primary or secondary function. You’ll either be most comfortable using T/F since it’s your driver process, or you’ll use your co-pilot T/F for decision making to support your primary perceiving process. If you’re a Feeler, you can access Thinking as your tertiary or inferior function, but it’s not as well developed or easy to use (same for Thinkers accessing Feeling). One of the hardest things for Feeling-type men and Thinking-type women to deal with is a sense that there is something wrong with who they are. It’s becoming more socially acceptable for men to express their emotions and women to be seen as impersonal, but not much. For example, ESFJ is often considered the preferred type for women in the United States. That leaves INTP as the opposite type. Nancy J. Barger and Linda K. Kirby’s research indicates that the words and phrases most often used to describe INTP women are negative. Moreover, all the female INTPs they interviewed reported feeling some kind of disconnect with or disapproval from other people because of their personality type. Several specifically mentioned that they think it’s their Thinking side which puts people off. Like these INTPs, many Thinking women feel out of place in society. Growing up, they identified more with boys and men than they did with other girls and were often criticized for not being “nice” enough. Similarly, many Feeling men felt like they didn’t measure up to what a man “should be” in the eyes of their father, teachers, and peers. They found competition and conflict uncomfortable and often felt more at ease around women and girls than other boys. This is one of the reasons finding your Myers-Briggs type can have such a positive impact. Knowing that you’re hard-wired to respond with Thinking or Feeling gives you permission to finally start using the judging function you feel most comfortable with. If you’re a Thinking woman who’s trying to use Feeling or a Feeling man who is trying to use Thinking, you’re crippling yourself by bypassing the way you naturally approach decisions. Learning to work with our inferior or tertiary function is useful, but it’s much easier if we start by developing our primary or secondary function first. 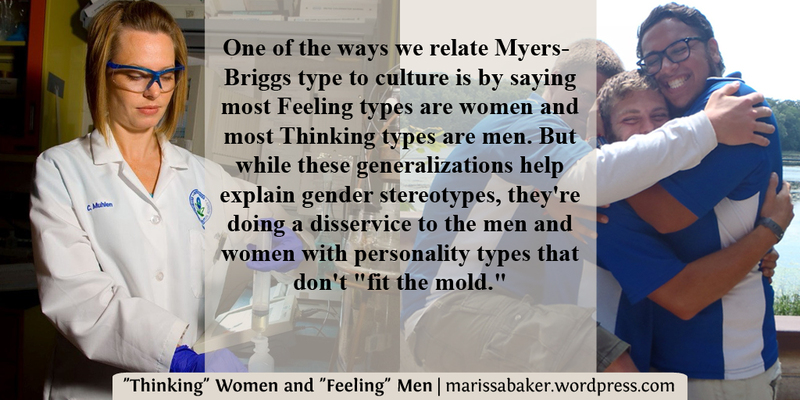 This doesn’t mean there won’t be any gender-related differences between male and female Feeling types or between male and female Thinking types. I know both male and female ENFJs, for example, and while they are similar in terms of personality the guys still relate to Wild At Heart instead of Captivating (John and Stasi Eldgredge’s books on the secrets of men’s and women’s souls). If the judging function you’re most comfortable with doesn’t match society’s stereotype for your gender, that doesn’t mean you’re “failing” at being a man or a woman. It just means the person God created you to be doesn’t fit neatly into a box … and that’s okay. Great article! I am an INTP woman, which is the rarest type for women. Which must be why I can find no one like me. Thanks 🙂 INT women are pretty hard to find. I’ve met a few, but not many. Ooops, you’re right. Thanks for catching that! Or I get judged for not fitting into the nurturing stereotype. (I’ve always wanted an awesome career and to earn my own money) Being an NT Christian female is even harder. Everyone thinks you’re being un-biblical for being yourself. However in the past few months I’ve really started to accept myself, and part of the reason why is because of articles like this one! Thank you! I’m so glad my article is one that helped you! It’s a shame gender expectations have become so tied to personality in many cases. I suspect there are quite a few Christians today who would accuse Bible women like Deborah and Huldah (I love that all the important men went to her for advice in 2 Kings 22:14) of being unladylike if they met them in person. INTP woman here… It’s definitely hard being a Christian NT woman. The traditional female role doesn’t suit you well because it’s soo SFJ. My personal Bible study has taught me how much of that is cultural and NOT Biblical anyway. There’s nothing wrong with being an intellectual woman and not being bubbly. I never identified with men at all though. Never was a tomboy. Felt more like an alien. Outwardly I’m very girly – pink, dresses, glitter. I’m also creative and absent-minded in a chaotic way, not appearing like most people’s idea of logical. Inwardly, I am all about theoretical systems, abstract concepts and logical consistency. I even analyze emotions and seek to “make sense of them”. I was raised by SFJ women and heavily shamed for my personality, routinely told I was cold and detached and argumentative, but I was simply being analytical and not intending to ruffle feathers by questioning people’s assumptions about reality. I’m not a nurturing hostess type, but I found I am a lot more patient, accepting and understanding than a lot of people because I am not a traditionalist and don’t push people to conform. I don’t care much what people do as long as I am given freedom to adhere to my own principles and explore ideas. It is hard to accept these qualities as gifts and not be shamed into thinking something is wrong with you. I usually test as INFP, though occasionally ENFP, ESFP, and once INTP, but I think I may actually be ENFP. I’m shy with some social anxiety but extroverted in the need for stimulation both social and otherwise, so that skews test results. I do value harmony and avoid conflict, but ultimately decide with logic. Do you think it’s common for females to test as Fs when they’re actually a type with a thinking aux. function and feeling tert. function? I have heard that types with a Thinking aux. function can mis-type as Feelers. Society really pushes women to act like the stereotypical Feeling type and that can skew test results. My mom is INTP and my dad is ESTJ. They were united in acting as if the “F” function is an immature and unnecessary part of life…which was a constant undercut to my sense of self-worth as an INFP because that’s my STRENGTH. They even pride themselves on their “amicable” divorce, which they decided to do after 0% consideration of how it would impact me. They agreed to disagree about their conflicting expectations of gender roles in marriage. My dad expects a domestic wife…and my mom wants a house-husband. They both tried to make me their “wife”! The healthiest thing that I’ve ever done is let go of my expectations of them to be “better” parents and let God deal with them. That sounds awful 😦 It’s such a shame when people get so caught-up in how they see the world that they can’t appreciate or encourage other’s strengths, and it’s so much worse when a parent does that to a child.